A Bronx Wedding Photographer at Marina Del Rey can find it hard to believe that he is still in New York City. The venue has the ambiance of a Mediterranean villa and gives guests the sense that they have traveled to a land far, far away. Marina Del Rey also offers spectacular views of the New York City skyline from each of the venue’s banquet rooms. The windows of the venue look out on the skyscrapers of Manhattan, as well as the Throgs Neck and Whitestone bridges. The space is elegant and modern, yet has the feel of old world Europe. A Bronx Wedding Photographer has so many wonderful venues to photograph at including Split Rock Golf Course, The New York Botanical Garden, Salsa Con Fuego, The Bronx Museum of the Arts, Bartow-Pell Mansion Museum, Villa Barone Manor, Pelham Bay & Split Rock Golf Course, The Bronx Zoo, Tosca Marquee, and Fiesta Deluxe Rental Hall & Catering.. This photograph from a Marina Del Rey wedding is like a picture from a storybook. The bride sits on a vintage, designed couch, looking elegant and poised as she gazes to the left of the room, out the window. The window shine back at her, with sunlight streaming through its panes and lighting up her face. This picture of the bride is enclosed in an antique mirror. The mirror is made of copper and swirls about on the wall, surrounding the image of the bride. 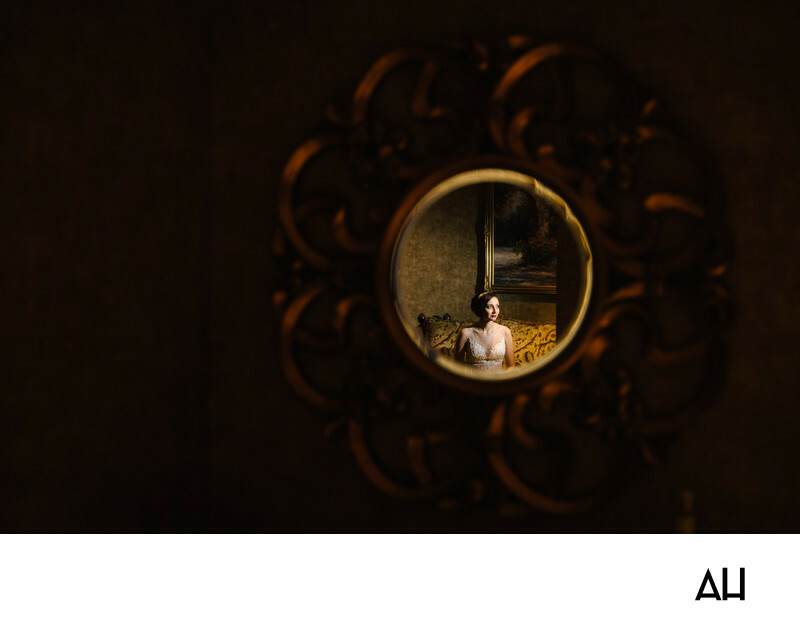 The wall space around the mirror is dark and covers the remainder of the photograph, giving the impression that the bride is held within this tiny reflection. She is like a fairy princess waiting for her prince to come and take her from the room, to join in the celebration of their magical wedding day.